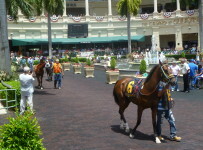 Florida’s two thoroughbred tracks will each have ten races on Wednesday. Tampa Bay Downs has a first post of 12:25 p.m. The featured ninth race is a $75,000 optional claimer at six furlongs on dirt for 2-year-old fillies. The purse is $22,000. All of the ten entrants have won either one or two races. Seven of them have run in at least one stakes race. 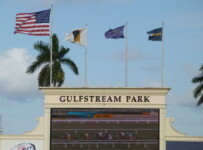 Gulfstream Park has a first post at 12:35 p.m. The fourth race has the day’s highest purse–$28,000 which is lower than the feature races on most weekdays during Gulfstream’s championship meet. It a $35,000 optional claimer at 7 ½ furlongs on turf for 2-year-old fillies. On its first race, Gulfstream has a carryover of $4,466.77 on the Super HI-5. The carryover on the Rainbow 6 is $260,541.70. It is on races five through ten. Conditions are fast and firm at both tracks. The Weather Channel forecasts are for a zero percent chance of rain during racing hours in Oldsmar where Tampa Bay Downs is located and for just a 15 percent chance of rain in Hallandale Beach, where Gulfstream is located. We will have coverage on our blog. *Both Florida tracks were dark on Tuesday. At Gulfstream on Monday, Bodacious Babe won the $60,000 Margate Stakes by 3 ¼ lengths over Mo Green. The race was seven furlongs on dirt for 3-year-old fillies that had never won a stakes race. Bodacious Babe caught the early leader Dad’s Kiddo coming out of the turn, and steadily pulled ahead to win in 1:23.76 on the track listed as fast. Mo Green advanced from third to second coming out of the turn, but could not mount a serious challenge to Bodacious Babe. My Awesome Mom finished third, 4 ¾ lengths behind Mo Green. Sugar Cone came in fourth, a neck behind My Awesome Mom. Bodacious Babe was the 9-2 second betting choice in the nine-horse field. Dad’s Kiddo finished eighth and Banree, the 9-5 favorite, finished last. Nik Juarez rode Bodacious Babe for trainer Jane Cibelli. The victory was Bodacious Babe’s third in ten career starts. She is a Kentucky-bred daughter of Mineshaft, and is owned by Panic Stable. Cibelli said she had no immediate plans for a next race for Bodacious Babe.